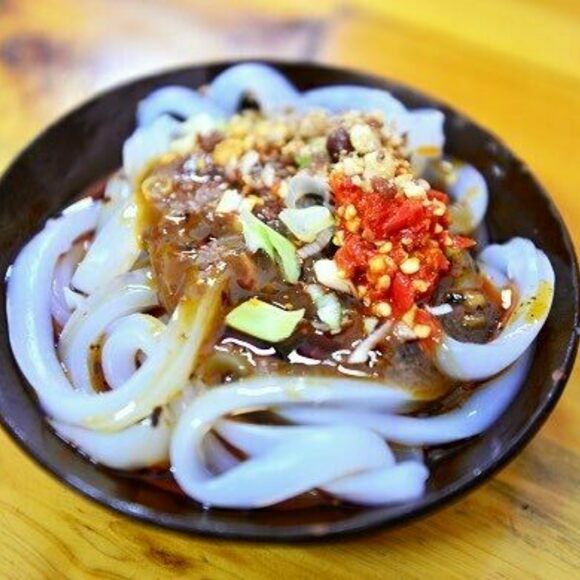 Anyone brave enough to slurp down a mound of sad jelly noodles, or shangxin liangfen, should expect to shed tears. Street vendors popularized these translucent noodles, made from mung bean or sweet potato starch, throughout the Sichuan province of China. But jelly isn’t what makes these slippery noodles “sad.” It’s the heap of hot chili peppers and oil that covers them. Everyone seems to agree that the name originates from the street noodles’ intense spice level. Some say it’s so hot, it’ll leave your taste buds brokenhearted and make you cry. Others believe that whatever emotional distress one is harboring before trying shangxin liangfen will be flushed out (likely by crying and drooling) in response to the overwhelming sensation of the burning sauce. Vendors also top the noodles with garlic, coriander, pickles, and other spices, which offer bursts of flavor, but do nothing to make the dish less hot. Should you see visitors to Chengdu crying on the street, fear not. There’s a good chance they just wolfed down a bowl of sad jelly noodles. This street vendor is known for sad jelly noodles that can make customers cry. This casual eatery offers Sichuan specialties known for packing intense heat.